Most of the tools I've selected can be used in a range of learning areas but they are all relevant to second language learning. If you are using any good tools not listed on these pages please email me the details and I'll add them. This particularly applies to language specific tools. 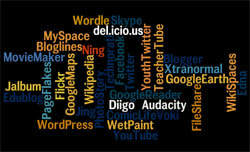 I located many of the tools listed on the following pages from Richard Byrne's Free Technology for Teachers blog. You might like to subscribe to Richard's RSS feed. Check out my Pinterest board which provides links to a range of documents and videos that outline how to use some of these tools. Click on each image within the board to navigate to the video or document it links to. The board covers a broad range of online tools and iPad apps.